“Celebrity Family Feud’ host Steve Harvey answered our burning questions about the show behind-the-scenes. In edition, we got an on-set preview to a show taping. 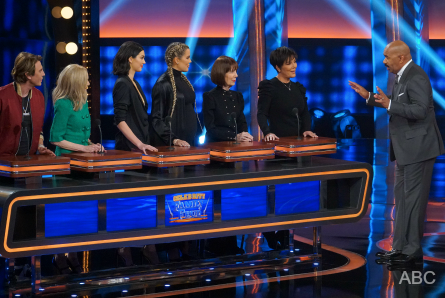 ABC’s “Celebrity Family Feud” is coming back for a fourth season which starts airing Sunday, June 10th. Hollywood Junket interviewed Steve Harvey who is back as the host and we also attended one of the show tapings this season. 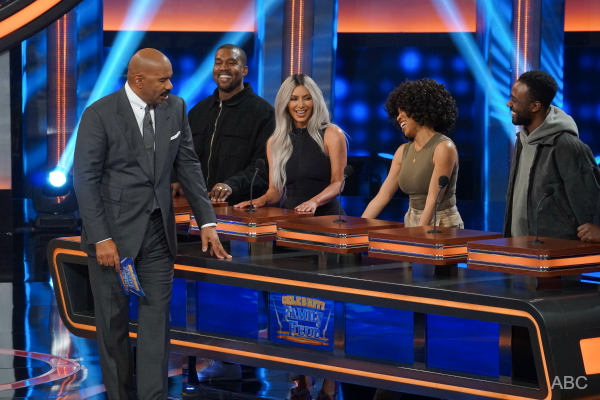 During a studio audience taping, Harvey commented on a much anticipated episode of “Celebrity Family Feud” coming up with the famous reality television family, the Kardashians. He said they were originally supposed to be competing against the Hitons. That’s Kim Kardashian’s old friend Paris Hilton. However, after the Hiltons cancelled at the last minute, Kim’s husband Kanye West stepped-in and suggested that he and his family play against the Kardashians. Apparently, Kanye is a big fan of the show, and it was the most that Harvey had seen him smile, he stated. 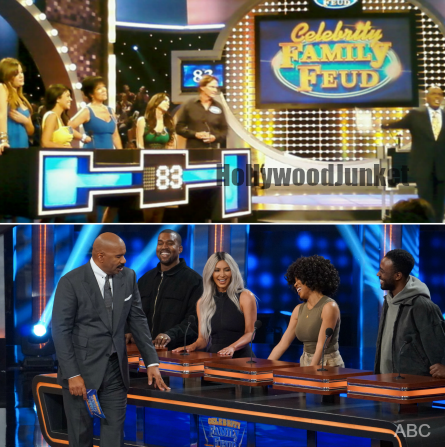 As a side-note, fans will remember, the Kardashians were on the first edition of “Celebrity Family Feud” back in 2008 with Al Roker hosting. They played against Ed McMahon’s family. Top: Kardashians from 2008, Bottom: Kim & Kanye from 2018. Harvey also added that Kim’s grandmother also wanted to play and meet Steve Harvey after getting all dressed-up for the event. Harvey confirmed that the episode’s taping was so good, that it will be a special one-hour episode, longer than the usual half hour format. Harvey’s inside takeaway was that the answers were a little better from the West side than from the Kardashian side being that the Kardashians are a little bit more “out of touch.” He also joked that aside from Kim, Kris, and Kanye, he didn’t know who the other players were. Kardashians on Celebrity Family Feud 10 Years Ago HERE! On a professional and personal note, Harvey said he “hates” Celebrity Family Feud because most of the celebs who play know “nothing” and they are “out of touch.” Since the game show is based on popular poll answers from one hundred day-to-day folks surveyed, his annoynace makes a lot of sense. When asked who he get star struck by on “Celebrity Family Feud”, Harvey answered mostly athletes. Harvey stated, “I’m such a sports fan. Today Steph Curry’s on, I’ve never met him. I’ve met Chris Paul before, and being a sports fan I don’t know that I’m star-struck, but I am like wow because like it’s sort of crazy.” He said all celebrities wish they could play ball, “all of them and you know and so those are kind of like the big moments for me.” Ironically, some of this year’s tapings of “Celebrity Family Feud” fell on March Madness weekend. During filming, one of the celebrity contestants’ siblings said he met his wife on the job at work. Harvey joked that, that wouldn’t happen now-a-days. Because men are taking risks when they compliment women now. Harvey commented about his angst for the political climate today. He told the studio audience that he’d love to go back to doing stand-up comedy while on his TV schedule down-time. But, he can’t say anything that will offend somebody. He’s all about making the money too. With his on-and-off bickering with the show’s stage manager, whom apparently suggested Harvey as the host of the show, he said once they stop mailing his checks, he’s out of there! He said “pay me!” It’s a labor of love for him for his seven chidern who some are college age. When asked if he ever previews the questions, Harvey stated, “No I don’t, that’s the one thing I never do. I never meet the contestants before the show and I never ask for the questions. So when I’m reading the question. I’m seeing it for the first time and that’s the way I want it because what’s made the show really popular is my honest reaction to everything.” Harvey said during filming of his first season hosting the show, the producers would tell him not to react the way he would react. However, after testing audiences they saw that his reactions were what people really loved. Harvey said he expresses on TV what a lot of viewers are already thinking at home. “Celebrity Family Feud” season 4 premeires Sunday, June 10th from 8 – 9 pm on ABC.